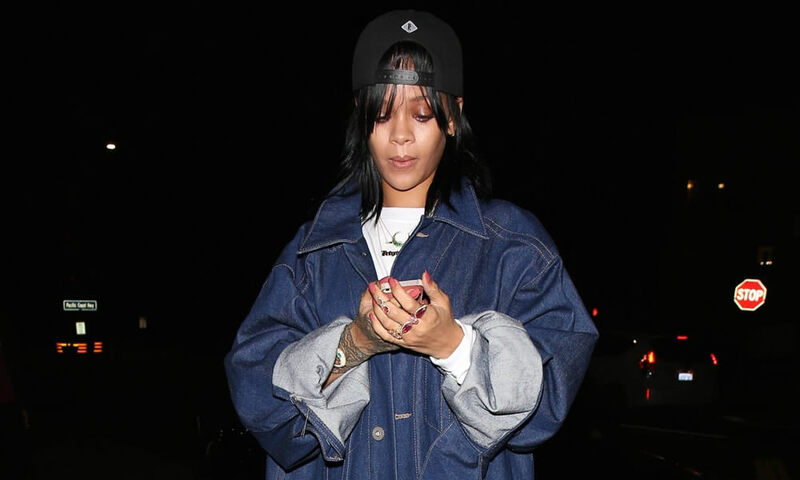 Rihanna was spotted at her favourite LA eatery last night. The singer was photographed leaving Giorgio Baldi restaurant sporting a shorty cut with long, wispy bangs. Rih donned pieces from a couple of emerging designers to create her look for the night. Firstly, her oversized denim jacket is by Matthew Dolan. From his Spring/Summer 2015 collection, the jacket has all the features of a classic denim jacket but on a much larger scale. FYI: This is the same jacket she wore to Baldi on January 27th with white Manolo Blahnik lace-up pumps. Click here to see those photos. Next, she rocked a unisex shirt by ASSK as a dress. This is the Survive or Die t-shirt from the brand’s Fall 2014 collection, which was inspired by survivalists. The brand was one of the three selected for the VFILES Fall/Winter 2014 fashion show. As you know, every season VFILES chooses a few emerging designers to showcase at fashion week. So far Rihanna has worn all three brands featured in the Fall 2014 collection. Rih rocked a pair of sculpted shoes from Christian Louboutin‘s Spring/Summer 2015 collection. The brightly-coloured d’Orsay pumps are called Dalida. They have a pointed toe, curved detail and a wavy mirage heel. The exact pumps are not available online yet but you can purchase the peep-toe style from Nordstrom. She also carried Givenchy‘s large pyramid pouch. The triangular handbag has an adjustable strap and a zip closure. Now let’s discuss the rest of her accessories. Rih wore a black snapback cap by Pigalle and protected her cell phone with Dimepiece‘s The Real Men Wear Pink iPhone case, which features a graphic of rapper Cam’ron wearing pink fur. She also rocked a Where you from? necklace from MALA by Patty Rodriguez that represents her hometown of Bridgetown, Barbados and a ring from Sabine G‘s new Prospero collection. This is the second time she’s worn the Navona ring, which is a rectangular ring made of 18k gold set with moonstones and pink topaz. The ornate band is set with tsavourite. The rest of Rihanna’s jewellery was designed by Jacquie Aiche and a few of these pieces may seem familiar because she’s worn them a lot in the last two weeks. These include a gemstone bar neklace, an emerald crescent necklace, a large horn cuff embellished with an emerald, a double teardrop lapis ring, a pink tourmaline knuckle ring and trinity ring, a diamond cluster anklet and a 5 diamond anklet. Shop the look below.